I’ve been enjoying the Udemy app so much I have become an affiliate. 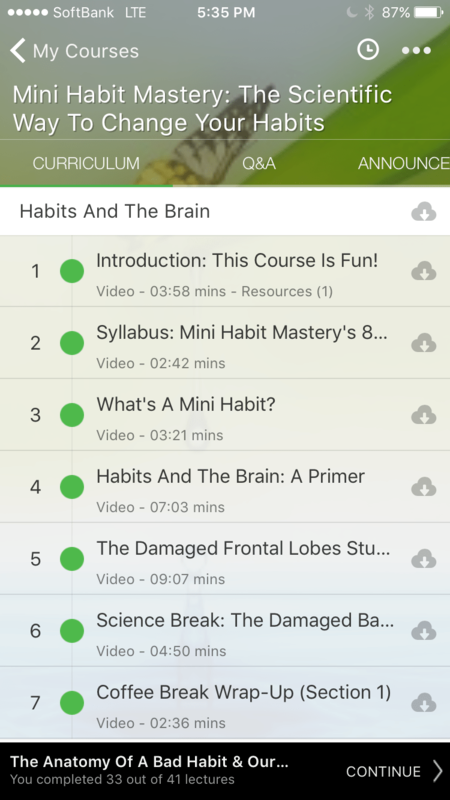 Using the Udemy website and app I’ve been watching the “Mini Habits Mastery” course on Udemy. In short, this course explains that in order to create new positive habits you need to go teeny tiny and small. (Thanks to Rob Schwarz, a friend and an NLP trainer who suggested the course. You can reach out to him at rob.schwartz@gmail.com for more cool ideas). The course has been worth it to me even though I’ve been mostly listening to it on my walks in Japan as opposed to watching the video content. 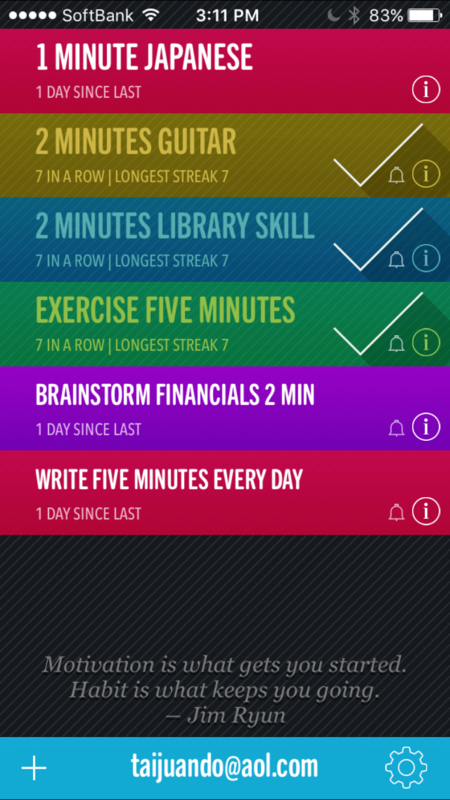 It’s been worth the price because it has allowed me to jump start some habits and think about how to maintain them. The course itself really digs in deep in an informative and entertaining way so check it out. However, the main point I’ve gotten from the course is that you have to go infinitely small to develop habits that you want to sustain you. For example, if you want to get in shape, set the goal of doing one push up every day. If you want to write, set a goal of writing fifty words a day. 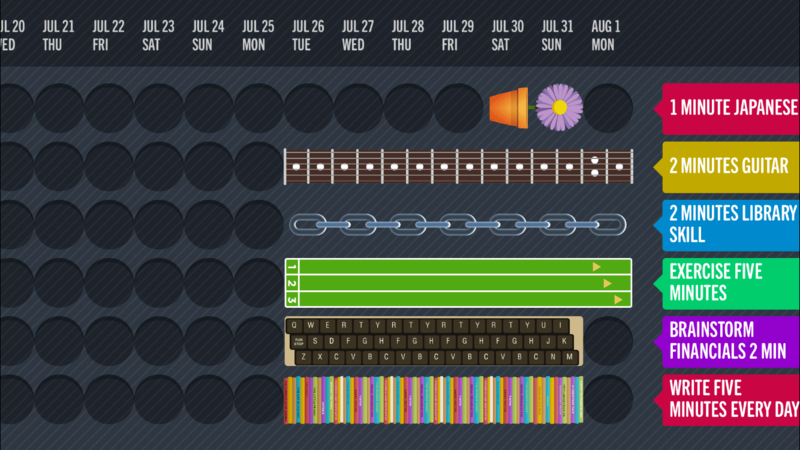 When you turn your phone sideways you can see the chain of habits you are creating with cute images. So far I haven’t broken a chain because it would be so sad to break the visual picture. What’s more important is that I’ve gained some momentum on goals that have seemed formidable. I signed up for some Udemy guitar courses and asked have practiced at least two minutes a day. It’s just two minutes so why not keep the chain going? Picture your on going chains of success. Part of my success with this so far is not wanting to “break” the picture by skipping a mini-habit day. It’s fun. Because the daily goals are very low stake it’s easier to have s feeling of success at the end of the day. Momentum leads to “bonus reps” as the authors of Mini Habits call it. If I have the guitar out to do my two minutes it’s easier to do more. The mini habits author explains not to secretly raise the bar because it’s the mini aspect of this system that makes it work. The chain effect makes it harder to forget where I was, whether it is the latest blog idea or the names of te guitar strings. So far it’s only been a week but it’s been a quiet but powerful way to change up my summer. Hope you will join me. Become part of the chain gang.